Saturday night, 9:26:25 pm. After arriving home from Boca Raton, Florida, the first words I told to my editor Jeff Hash...I must be crazy. The reason I say that is because after waking up at 4:15 in the morning, and after about 3 and a half hours of restless sleep, I had arrived home after probably the craziest road trip one could ever take. My plan started to take shape a week ago after a long time follower of my work, Lou Bruno, started egging me on about making the trip down for the USA/England game. Don't get me wrong, last week wasn't the first time he would attempt in goading me into making the trip down there; it was just the first time he made the right offer I couldn't refuse. Now why Boca Raton, and not the local US Soccer viewing party at Lynch's Irish Pub in my own town of Jacksonville, was because of two other people. The first being Christopher Harris (The Gaffer of EPL Talk fame), and the other Kartik Krishnaiyer. Since those two were partially responsible for me still writing today, I figured it would be worth the trip to head down to the World Cup Buzz watch party. My plan was to drive down early and be there in time for Argentina/Nigeria. My thinking was if I stayed home for South Korea/Greece, I may have fallen asleep. Based on what I was told by plenty of people, I was right on that assumption. After leaving home at 5:15 Saturday morning, I made it to Boca at 9:45 am. After meeting Lou at the hotel, we arrived at the game just in time to see the kickoff of Argentina/Nigeria. My thoughts on the game are simple ones. Argentina did well to get their early goal, but were lucky to not see Nigeria equalize. It was interesting to see the number of Argentine fans who were there for the match and how unhappy they were starting to get at Argentina's inability to pull away. As for those at my table (Lou, Kartik, and one other), we kept getting incredibly frustrated at the chances Nigeria missed. At full time, those around me thought 'good match, let's move onto the main event'. The two and a half hours before kickoff were just too nerve racking for my already fragile nerves. When I saw the lineups, I was less than happy at Bob Bradley. The fan in me couldn't figure out why on earth the hot foot in Edson Buddle was kept on the bench for Findley. When I saw England's lineup, I couldn't help but laugh. Milner in the midfield proved as ineffective as I expected him to be. Ledley King is always an injury waiting to happen. Steven Gerrard and Frank Lampard may as well been tied together in the center of midfield. The one thing that did scare me, however, was seeing Heskey in the attack. Meanwhile at the sports bar, by 2 pm, the place looked like it was one person short of being shut down due to fire codes. 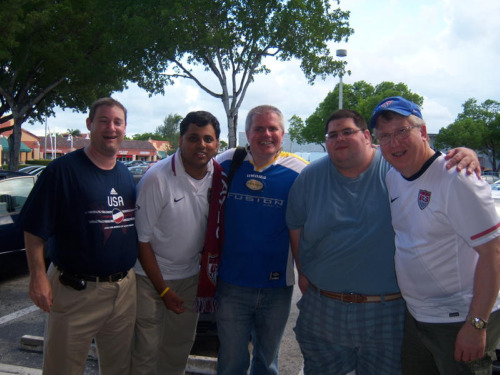 If I had to guess the ratio of US fans to England fans, I would say the US outnumbered the English 9-10 to 1. Don't get me wrong, there was a good pocket of England fans in the building, but they were easily down out by a couple of American fans with vuvuzelas. By kickoff, I felt sick to my stomach, and just wanted the game to be over with. The first half was a tale of two emotions. The first coming just four minutes in when Emile Heskey proved my worries right by perfectly picking out Steven Gerrard for England's opener. The nerves that Kartik and Lou pointed out from the US players coming out started to resonate in my own being. I could barely keep attention on the many TV screens the joint had. In fact, I pretty much wanted to just drive back home safe in the knowledge that the US had choked on the biggest stage the sport provides. While the set pieces looked threatening, the only thing that looked threatening was the set piece itself, not the final product. Then with halftime closing in, the moment all Americans who give a damn about the National Team arrived with the bouncing of a ball. The second it took from Clint Dempsey's shot to USA 1 England 1 could be defined by four unique emotions. The first being anger at the fact Dempsey shook Gerrard off with ease and decided to waste his energy with what amounted to nothing more than a speculative effort from 25 yards out. The second was just humor at the fact another England keeper couldn't handle a bouncing of the ball. The third one was just the .01 second shock that the ball crossed the line, followed by joy undefined that no Chelsea match has ever given me before, and I doubt ever will. From high fives to hugs, and seeing the pocket of England fans sliding further into their seats, it was one of the greatest thirty seconds of my life. The second half infuriated me. With England losing their shape easily, I thought it was the perfect time for Bob Bradley to bring in Buddle, Gomez, and Torres off the bench and get a second goal. Now that may have been the plan, and was changed when Tim Howard ended up on the turf with an injury that I don't think many people still know the extent of. After Robert Green tipped Altidore's shot off the post in the 66th, I thought the game may as well had been over. With Tim Howard coming up big late, plenty in the sports bar were happy at the full time result. The only ones that weren't were the ones in our perch at the bar. Driving back home, all I could keep thinking about was did the game live up to all the hype six months could provide. My answer I'll confess is a bit of a cop-out. While the game provided plenty of excitement, it wasn't the kind of excitement that came with a well played, hard fought game. In my mind, the only way the game could have lived up to the hype on this side of the Atlantic Ocean was with the game ending in a US win. While the New York Post called the game a 1-1 win, it wasn't a win. It was only one point for both England and the United States who now share second place with Slovenia ahead of them. As Freddie Colemen on ESPN Radio said as I neared my residence, this result means nothing if the US can't get out of the group stage. He's right; the only way the hype can be lived up to is if the United States can get out of the group stage. True enough, the tie with England means little if we do not advance. Your attendence hlep make the day memorable. Yeah, the game needed to be in the knockout rounds, a draw was always going to suit both teams as we predicted. From what i saw on the pre-match vid link it was highly charged in the bar, wish I could have made it - I'm used to the vuvuzelas by now.